High Wycombe, UK, 18 October 2016: At Apps World 2016 (19 – 20 October, ExCeL, London) international POS printer manufacturer Star Micronics (Stand D18) will be demonstrating its extensive range of hardware and software mPOS solutions. With the largest portfolio of Bluetooth and Cloud printing solutions offering free-of-charge digital receipting, Star sets itself apart from other POS printer manufacturers. Star’s experience in hardware integration in the ever-expanding mobile payment market as well as comprehensive multi-product API and SDKs allow developers to easily integrate custom Android, iOS and Windows based apps for retail, hospitality, event ticketing and queue management. 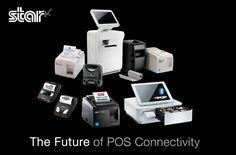 The latest additions to the TSP100 futurePRNT™ series from Star – TSP143III Wireless LAN (WiFi) and TSP143III Bluetooth offer cable-free high speed Bluetooth and WiFi mPOS printing solutions combined with futurePRNTsoftware. The TSP100 series also includes the convenience of an internal power supply along with a vertical mount kit in the box and provides compatibility with major operating systems including Android, iOS, Linux, Mac OS and Windows. The TSP143III Wireless LAN provides easy pairing thanks to a simple WPS connection offering straightforward wireless setup while the TSP143III Bluetooth model features an autoconnect function for iOS after power on or an out-of-range situation thus ensuring functionality at all times. Digital receipting eliminates the issues typically associated with email receipting including the time taken to record email addresses and the potential problem that these could be taken down incorrectly. The immediate advantage perceived by the customer is the choice to remain anonymous and yet still receive a digital image of the receipt and coupon when offered. Star’s free-of-charge digital receipting service is available across its range of single station thermal POS printers. This service offers a fast route to providing the customer with a digital copy of a print receipt as well as access to analytics, an in-store customer survey and device management tools that provide the real-time status of printers across the entire estate. With zero development required, the service is enabled within the printer driver and works independently of POS software. Triggered by a traditional printed receipt, a digital copy of the receipt is sent to the AllReceipts™ App on the customer’s mobile with no email address or mobile number required. Receipts can only be claimed once and are then deleted, while saved receipts can be viewed by date or by operator with personal or business tags on the customer’s device. The beauty of this service is the ability to take advantage of the reverse side of digital receipts, as on printed receipts, using the Receipt Flip feature to display terms and conditions, store policies, promotions, marketing material, etc. An additional tool allows the operator to provide links to promotions, discounts, coupons, etc. on the Engage NOW landing page. Customers using the AllReceipts App can simply tap on the operator’s logo from the list of receipts on their smartphone and be directed to a URL that the operator specifies. Engage NOW is secure and easily customizable, providing a highly personal customer connection.